Complex life such as ours requires tight control of factors like energy supply, cell division, brain activity and immunity to maintain our bodies’ structural and functional integrity. Failure to do results in metabolic disorders such as obesity, anorexia or Diabetes, cancer or degenerative disease such as Alzheimer’s, excitability disorders such as epilepsy or migraine or autoimmune disease such as multiple sclerosis. 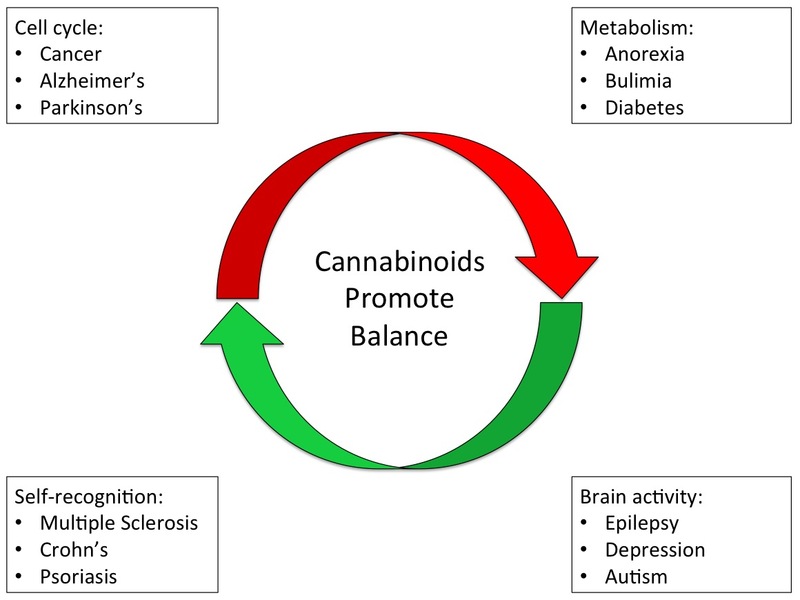 To achieve such balance, or homeostasis, nature evolved a biochemical feedback system called the endoCannabinoid system. Put bluntly, the endoCannabinoid system is what separates us from slime molds. Through eons of co-evolution (cultivation) Cannabis varieties have developed a complement of cannabinoids that are equally, if not more, potent in regulating our most crucial biochemical systems. This offers possibilities to use plant cannabinoids to boost our endoCannabinoid system to prevent or combat disease.